I recommend ALL Winix shoppers read the lengthy general remarks at the top of this page, which are not repeated for each model. But those who know the model they want can scroll down and find model numbers highlighted in yellow. (such as Winix 5300). Attracted by value, many buyers approach the Winix products without understanding the Plasmawave technology, an oxidizing air cleaning system, and the origins of the Korean company which makes it. This makes it difficult to master the subtle differences in the Winix product line. This confusion is especially evident when replacement filters are sought, large numbers of buyer reviews express frustration when the filter they have purchased seems not to fit the product. Choosing from a full stable of similar products, and with natural communication barriers inherent with a foreign manufacturer, most Winix shoppers can benefit from more depth than the typical "air purifier review" offers. Winix PlasmaWave is an oxidizing air cleaning system, a fact which eludes or confuses many buyers. Back in the 1990's there were a few air purifiers on the market, but sales were very modest. "Energy saving" building practices were embraced, eliminating an age-old health and safety device, formerly known as "windows." These air-tight structures trapped airborne contaminants, and building occupants, in stale recycled air, and "sick building syndrome" was born. The ensuing period of dizzying growth in indoor air quality engineering (1998-2005) was called "the mold rush." The mold rush spilled over into the residential market, and by the peak in 2005, room air purifiers were a multi-billion dollar industry. As the market matured, a shakeout was inevitable. Market leaders Sharper Image (Ionic Breeze), Oreck, and Ecoquest, collectively holding around 70% of the residential market with electrostatic ozone-based oxidizers, became vulnerable. Ozone is a specialized form of oxygen which can be created in an air purifier operating at extremely high voltages. The easiest way to think of air cleaning by oxidiation is "burning pollutants at a microscopic level." High concentrations of ozone will oxidize pollutants very effectively, and most of the widely perceived benefits of the high voltage air purifier era were due to ozone. Then somebody noticed that ozone was toxic and possibly dangerous, when concentrated enough to work against indoor air pollutants. Consumer Reports, which had become a kingmaker in the air purifier space, issued papers in 2005 and 2007, denouncing the ozone kings. In itself, this was a public service, but the CR kingmakers went on to incorrectly demonize "ionizers" and promote some very questionable products, most notably the Hunter Fan purifiers, as the new pretenders. Next was "the ozone panic," which bankrupted Sharper Image, decimated Oreck and Ecoquest, and cut the residential air purifier market in half by 2009. Meanwhile, Japanese conglomerates Mitsubishi and Sharp Electronics had developed a new kind of electric oxidizer, the plasma-ion streamer. The plasma ion streamer operates at low voltages, creates very short-lived but powerful oxidants, and can be safely used in place of ozone. Plasma ionizers, of which Winix PlasmaWave is a leading example, emit ions in both positive and negative polarities. Negative ion generators, which had been around long before the plasma streamers, do not create oxidizers. Dual polarity plasma ions split airborne water vapor molecules into powerful free radical oxidizers, known as "hydroxyls." Ozone's main issue was that it took a long time to decay, but plasma ions are gone very quickly when the power is turned off, a critical safety feature. Hydroxyl radicals work at the molecular level, destroying ultrafine (.1 micron) particles, chemical and odor molecules, and killing microorganisms. In bringing its new Sharp Plasmacluster air purifiers to the American (and global) market, Sharp followed what I call the "Toyota Land Cruiser strategy." My synopsis: "To establish a beachhead in a foreign market, over-deliver with unsurpassed quality, building a reputation for bulletproof reliability, once established fade gradually to increase margins." It worked for Sharp, as it had for Toyota, the Plasmacluster was an overnight success. American and Chinese consumers are strongly influenced by price, but Korean buyers are among the world's most discerning when it comes to quality and value. South Korea's air purifier industry (Coway and Winix primarily), while successful domestically, struggled to enter the declining U.S. air cleaner market after 2008. Winix designed PlasmaWave, its own plasma ion streamer, and brought it to the U.S. market as Winix 5000. Though Winix 5000, which included an elaborate Sharp-like filter tray with permanent fiberglass prefilter, was priced at $299, well below comparable Sharps, sales did not take off. Winix was forced to improvise, their experiment eventually became a successful business model. Most offshore air purifier builders are loath to cut features, they tend to cut quality when competitive pressures loom. It is feasible to build a very cheap air cleaner loaded with "7 air purifying technologies." But Winix knew cutting quality would hurt their domestic base in Korea, so Winix slashed features. Winix swapped the filter cassette tray (photo at right) for two loose filters (photo below), scrapped the dust sensor, and introduced the "new" 230 CADR (pretty strong) Winix 5300 at an unheard-of price, $149. Yep, they cut the price in half! without sacrificing quality. And kept True HEPA Filtration which captures 99.97% of 0.3 micron size that actually pass through the filter. Competing Sharp Plasmaclusters, with lower CADRs, sold for over twice as much. It seemed too good to be true, so I ran out and bought a Winix 5300 right away. Years later, my Winix still runs perfectly, blowing very low particle count exhaust through a Fellowes (Winix rebrand) HEPA ($30) and extra layers of cheap carbon cloth cut-to-fit prefilter. I doubt my 6-year old 5300's PlasmaWave is still working, but the early Winixes, like Sharp and Toyota before them, were built to last. Of all the air purifiers I have owned, about 50, the Winix 5300 is the best value in terms of long-term price-performance ratio. Around the time of the Winix market entry, Sharp changed the playing field, adding humidifier capabilities to Plasmaclusters, adding costs and user chores. Since a plasma ionizer splits water vapor molecules, there is a drying effect, noticeable where low humidity prevails. Also the plasma machines need a certain minimum level of humidity to be fully effective. So Sharp experimented with the humidifier/purifier, a mistake in my view. That break was all Winix PlasmaWave needed to come ashore, getting big box retail shelf space and a rebranding deal with Sears. Sharp never fully recovered and eventually joined nearly everyone in the business, moving Plasmacluster production to China. Winix, of course, is "Made in Korea." Cutting features to hold price brought both success and ardor for Winix. They now had two kinds of filter packages, the cheaper system with two loose filters and the "Ultimate Cassette" three filter tray-enclosed package, and sets of models distinguishable primarily by which filter pack was carried. 1.) Winix has three chassis/bay sizes, Size 17, Size 21, and Size 25, each sold as economy models OR premium ("ultimate") products, based mostly around the filter pak. 2.) There are just two cabinet styles, which I call "boxy" and "futuristic," so images of a series will all look alike, though of different sizes. 3.) There are two filter packages, Ultimate Cassette Tray and Standard, substitution is possible, but not within a set. To reach high margin premium buyers after the beach head is built in the economy class is quite challenging. I compare Winix's situation to Hyundai motors' repeated attempts to break into the luxury car class - "Hyundai Genesis marketing" (Hyundai Genesis is a luxury automobile). What Winix did was to retain the higher prices on its premium line, and make the expensive cassette tray a disposable good. Competitor Sharp Plasmacluster sold (also pricey) replacement filters individually, but Winix required premium model owners to replace the whole filter tray (around $80 to $120) in order to get a single new filter. To install economy filter paks in a cassette based Winix air purifier, users must discard the cassette frame and permanent prefilter. Vendor websites may not be upfront on this, offering incorrect filter sets to naive bargain hunters. Hundreds of user reviews evidence the frustration as buyers tried to force-fit "economy" HEPA filters into the slightly-too-small "ultimate" cassette system's plastic tray. There is maybe 3/16 inch difference in size, but you can't squeeze a HEPA filter without ruining it. So here is how the Winix game has played out: they can sell lots of commodity-priced entry level air cleaners, but have difficulty attracting and retaining upscale buyers. But they have kept trying, with restyled cabinets (FresHome) and the Signature Series, relegating the "PlasmaWave" name to the cheaper models. Note that ALL Winixes have Plasmawave ion streamers, but the name is now associated with the original series only. But all the while the Winix niche keeps narrowing, sandwiched between Chinese-built products (Whirlpool, Honeywell, Sharp...) and their Korean competitor, Woojin-Coway (RabbitAir and Coway). The result is that the value-package PlasmaWave 5300, still well below $200, continues as the Winix best seller. Every Winix is made with better quality control than competing off-shored budget-priced air purifiers. But there are still lemons, with slow quality slippage, which continues across the entire air cleaner industry. U.S. consumer reviews mention the "new car smell" from the antiseptic "antiviral" prefilters everybody in Asia wants since the SARS virus panic. All plasma ion streamers make some noise, but the Winix PlasmaWave draws user reviewer's ire for making squealing noises with time. A few reviews complain of squeaky fans, and a small percentage say the purifier had faults that led to failure. Winix air purifiers, especially the value models, are not suitable for smoking, chemical vapor, or heavy odor remediation. Many buyer reviews express disappointment with performance verses these pollutants, which are difficult even for premium-priced air purifiers. These issues are relatively uncommon, considering low quality competition in this price bracket. A more persistent problem is what I call the "communication gap" between Asian manufacturers and U.S. consumers. But decisions are made in Korea, with Korean domestic considerations and values predominant, often resulting in gaffes in the American market. The Toyota strategy called for Winix to chop features to hold price after the 5300 beachhead was firmly established. This they did, cutting the 5300's remote and its infrared sensor while holding price. But somebody had just stockpiled the packaging and print media user guides in quantity, and a decision was made to keep using these materials, which depicted the remote. Vendors were not effectively notified and continued to show the remote after it was dropped. U.S. consumers were predictably outraged, but I suspect this came as a surprise to Winix management. Worst of all, the remote was the only way to shut off the plasma streamer, sometimes irritating to the chemically and/or noise sensitive. Winix eventually fixed the purifiers, (hold power button in for 3 to 5 seconds to control Plasma) but not the manufacturer's literature. Looking at the online user manual, the remote is no longer there, but still no mention of the "secret" PlasmaWave power button shut off trick. Winix warrants their air purifiers for one year from the date of purchase. When installed, operated and maintained according to all instructions supplied with this product, Winix, at its option, will repair or replace the product if it FAILS because of a defect in material or workmanship, as determined by Winix. Numerous user reviews attest to good faith from the company, when these conditions are met, Winix will replace the product with a new air cleaner. Users pay to ship the defective unit back to Winix. Winix buyers with minor issues, not "failure," seeking warranty support may not get the warm reception some Americans still expect. Air purifier buyers who want fast-phone-answering will need to choose Rabbit Air (Korean-built Coway, recommended here), at around $400, to get premium customer service, no value brand can provide it today. In the air purifier business, nobody is perfect, especially value brand products selling under $200. I consider Winix air cleaners to be significantly better than all Holmes, Hunters, Bionaires, most Honeywells, and other department store brands. Winix became a worthy equal to their mentor, Sharp Plasmacluster, my former global favorite, as Sharp management was distracted by problems in their big-screen TV segment. Winix closest competitors are the Chinese-made Whirlpool legacy models AP51030K, around $300, and AP45030K, about $239. All Winix buyers should understand the filter cassette tray verses economy filter set issue, a choice must be made. With the caveats above, I very frequently recommend the Winix air purifiers to folks who need to clear larger rooms of particulate pollutants on a tight budget. First time buyers should have a Winix on their short list. 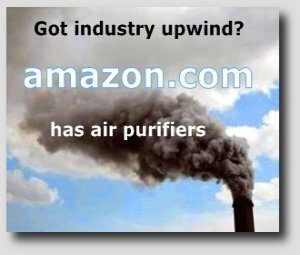 Another group of buyers are those who, like myself, demand the air they breathe to be absolutely clean, and will run multiple air purifiers to achieve that goal. For us, a Winix can pay for itself by keeping large particulate from prematurely ruining a $400 set of filters running in the same room. Note that the official model designators are preceeded by "WAC," as in Winix WAC5500, I drop the prefix. 4.) Ultimate Pet Series, "boxy" style, cassette tray filters, size 17 (9300), size 21 (9500). The original Winix series was called "PlasmaWave," but today Winix uses that brand name to describe the value-oriented models without the filter cassette box. Winix PlasmaWave 5300 is the same model that set the bar on power and quality/price ratio, catapulting Winix to success in the US market. 5300 is still the Winix best seller, with over 1,129 amazon buyer reviews, averaging 4.4 stars, attesting to its popularity. However, the current Winix 5300 was downgraded to hold price, the remote deletion debacle is described above. After all the fuss, most vendor's product descriptions now read "Does not include a remote control." I recommend buyers ignore the always-to-large manufacturer/AHAM room size (350 sq. ft.), and install Winix 5300 in a room no bigger than 280 square feet. WInix 5300 carries the Size 21 economy filter package, one carbon prefilter and one True-HEPA filter. 5300s ship with four prefilters, a one-year supply. A few user reviews confess to mistakenly installing all four at the outset, as there is plenty of room in the filter bay with the big plastic cassette box gone. 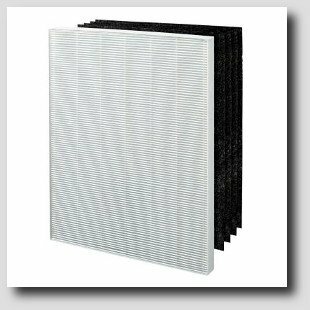 HEPA filter replacements are manufacturer recommended every 12 months, and prefilters every 90 days. The $43.00 Winix annual filter kit (#115115) includes one True HEPA and 4 carbon pre-filters. Several reviewers with strong pollutant issues say HEPA replacements can be needed in less than 1 year, but my 5300's original HEPA ran for 4 years behind a beefed-up prefilter stack before restricting airflow. My favorite feature of the 5300 is all the extra space left in the filter bay now that the plastic box ("cassette tray") is gone. This is the perfect air purifier for user filter substitution, the inexpensive Fellowes HF-300 HEPA and a series of generic cut-to-fit prefilters and carbon cloth layers cuts my long term costs to less than $30 per year. And laser particle counter tests prove my modified and tape-sealed Winix 5300 is blowing cleaner air than purifiers costing double or triple the 5300's price, now up to around $170. Winix 5300 has four fan speeds which can be modulated by a digital odor sensor when users select Auto Mode. Auto Mode keeps noise and operating costs low, but users should NOT rely on Auto exclusively. There is no particle sensor, and the odor sensor can't cost more than about five bucks. User reviews note that Winix 5300 is good at detecting strong odors close to the air purifier, but many reviewers distant scent problems go unnoticed. One big flaw in the automatic air purifier design is the tendency to filter only the air near the machine and then turn on the "clean" light and slow down. For best air quality, run the Winix on high for at least 20 minutes before occupying the room and 30 minutes before bedtime if Auto Mode is to be used for the night. Displays include replace filter indicator, mode (Auto/Manual/Sleep), fan speed selected, and odor detected. When Auto is selected, darkening the room starts Sleep Mode, setting the fan on low and dimming the display. Winix 5300 is a PlasmaWave ionizer, an oxidizing air cleaner. Winix 5300 is quiet on lower speeds, and Turbo is quiet relative to the high CADR. However, some reviewers find Winix 5300's PlasmaWave sound, sometimes described as a "squeal," annoying. Winix PlasmaWave 5300 is EPA EnergyStar certified, using very little electricity on low. Dimensions are 16.3 by 8.5 by 21.7 inches, and weighing 15 lbs, 5300 can be moved between rooms effectively. But users moving the Winix 5300 will notice the absence of a built-in handle. The 5300 held $150 for years, but recent price creep has it up to around $170. Winix 5300-2 is the second generation of the very popular 5300 series. The biggest difference between the two is a new control panel, sleeker looks, an integrated 1/4/8 hr. timer, and slightly lower pricing. Additionally the 5300-2 spans ever so slightly more square footage; 360 versus 350 sq. ft. Similarities between the two air cleaners are size 14.9” (W) x 7.8” (D) x 23.6” (H) and weight (17.6 pounds). Both units are suited for medium-sized rooms (kitchen, dining area or bedrooms). The package contents are no stranger: impressive three-stage air purification system with PlasmaWave technology (discussed above), four fan speed settings (low, medium, high or turbo), auto/sleep mode, odor and light sensors, updated digital screen, the greatly desired timer button (1, 4, 8 hours), air quality and change filter indicators. The first layer of defense begins with particles being captured by the pre-filter. The carbon sheet filter features protection against VOCs, household odors, pets and smoke. 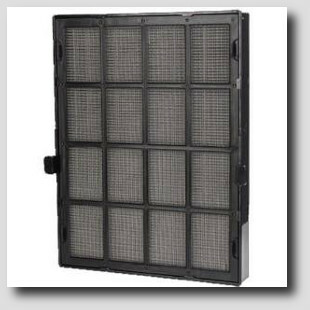 The 99.97% True HEPA filter captures allergens – pollen / dust / pet dander / smoke / microbes and mold spores. Filter replacement costs are not exorbitantly high with the bundled package: a pre-filter, plus four disposable odor absorbing carbon filters and one True HEPA filter. Winix Replacement Filter A, item no. 115115, is a complete one-year filter set; an $80 value, and the pre-filter part number is 4521-0012-03. Intervals between replacing air filters may vary depending on the level of pollutants in your surroundings. Optimal substitution recommended for the carbon filter is once every three months; while the True HEPA filter will last up to twelve. Neither the carbon filter, nor the True HEPA filter, can be washed. I recommend using a vacuum cleaner or a soft brush to tidy up the pre-filter. If excessively soiled, rinse off with water at room temperature; avoiding detergent or soap. Allow 24 hours, or more, to dry in a well-ventilated area before using. If not, you take the risk of cultivating a bad odor. The Winix 5300-2 carries the EPA EnergySTAR seal, is AHAM certified, and CARB certified. The Winix PlasmaWave 5300-2 will not have a substantial impact on your utility bills with standby power 1.3 watts and total max energy consumption 58 watts. Compared with other household appliances; a ceiling fan, for instance, consumes anywhere between 25 to 75 watts and a coffee maker 800 to 1400 watts, max. “Silence is golden”, a favorite phrase often bounced around by one of my sons, defines a quality characteristic of the Winix 5300-2. On low setting, this true HEPA air purifier is ideal for your bedroom because it’s nearly inaudible. If you’re looking for an extra bit of effectiveness, try turbo mode. While significantly louder (what do you expect from a setting called “turbo”), this level can generate a significant amount of air. Noise level ratings are fairly similar to previous Winix WAC5300, clocking in at 27.8 for Low, and a maximum level of 54.8 dB. AHAM/Winix unrealistically list 360 sq. ft. as an appropriate maximum room size. I say this 240 CADR machine should be installed in a room no larger than 280 square feet. The Winix 5300-2 doesn't come with a remote. Neither my wife nor I have ever used a remote for any of the purifiers we've owned; and there’s been many. If you have mobility issues and need to change fan settings often, highly recommend getting a unit with one provided. The front lights are a little bright for my taste. Activating "sleep mode" will turn (almost) all of them off. Winix offers a two-year warranty period with proof of purchase; valid only in the US of A and Canada. The Winix PlasmaWave 5300-2 for its price-to-performance ratio cannot be beat for this brand. Light weight. Quality built exterior. Sealed body framework. Visually improved and modern. Quick easy set up. A brand you can trust. Winix is one of my favorites. If you’re satisfied with the previous version, this upgraded version will suit you well. Winix PlasmaWave 5300-2 Air Purifier at Amazon.com. Winix PlasmaWave 5300-2 Air Purifier at Sylvane.com. Winix Plasmawave 5500 Air Purifier is almost the same as the original 5300, but 5500 was introduced with a new "washable" longer life HEPA filter, a particle sensor, and includes the controversial remote, which controls the PlasmaWave and fan. 5500, despite the similarities, sells for $30-40 more than 5300. Winix 5300 PlasmaWave is fairly popular, 968 amazon.com customer reviews average 4.4 stars. As one would expect from an identical chassis, Winix 5500 has the same strong CADRs as 5300; 248 Dust, 251 Pollen, 235 Smoke. So my room size suggestion is also the same - ignore the inflated manufacturer/AHAM room size (350 sq. ft.), Winix 5500 should do well in 280 square feet. Again, for emphasis, Winix PlasmaWave Series (5300, 5500, and 6300) have the Winix size 21 filter bay. These three all have the economy 2-filter package, NOT the "Winix Ultimate" filter cassette tray and fiberglass screen prefilter. The economy package's "Odor Control Carbon Pre-Filter" catches dust and some gas/odor pollutants. Winix 5500, while receiving strong user review marks for light odors, is not the choice for strong odors from smoking or pets. But the Winix PlasmaWave Series is perfect for user-addition of extra carbon, either a Moso Natural carbon bag or cut-to-fit carbon impregnated mesh. When 5500 was introduced, a "permanent HEPA" marketing fad was sweeping the air cleaner industry. I said at the time consumers should not buy into this fantasy, which ended badly for several manufacturers, notably the Hunter Fan Co. So Winix 5500 came with a "Washable" Long Life True HEPA filter. In fairness, Winix never pretended their washable HEPA is permanent, as some sellers did. The Winix long life HEPA will last two to three times as long as Winix non-washable HEPA filters, which typically last about a year (smokers and pets - 6 months). I see user reviews saying they "save money" by leaving the prefilters out, running the Winix with just the HEPA. For longer HEPA life and best economy, increase prefiltering, not decrease it. People, I have a couple air cleaners running with old kitchen dish towels as prefilters, and every purifier I own has at least one layer of air conditioner polyurethane foam filter ($1 at big box hardware) in it. Winix claims the 5500's HEPA filter can be washed up to six times. But user reviews say the washable filters, identifiable by a blue edge, don't last nearly that long. Some notice deterioration of the filter after just one wash. The greatest confusion for Winix buyers revolves around replacement filters. ALL SIZE 21 replacement filters, and the economical Fellowes HF-300, will fit Winix 5500, so if buyers don't like the washable filter, others will fit. 4.) Fellowes HF-300 HEPA (filter identical to #2 above, but sold without prefilter pak), $30. Winix 5500 is fully automated, with computer-controlled fan speed in response to sensed pollutants. The plasma wave automatically turns on at power up, so users must manually turn it off if no ion stream is desired. Winix air cleaners default to PlasmaWave On and Auto Mode each time they are turned on. Users who want to run their automatic air purifier on high speeds manually for several hours daily, as frequently recommended here, will have to select manual mode and set fan speed. Many user reviews bear witness that a percentage of automated air cleaner buyers do not understand that Auto Mode is a convenience feature, NOT a guarantee of clean air. A row of green lights on the front panel signal Plasma off/on. Plasma is controlled, on the Winix 5500 by a button on the remote or by holding the power button down for 3 to 5 seconds. Like every Winix, 5500 has a quiet BLDC motor, the two lower speeds are OK for night use. Winix PlasmaWave is quieter than the great majority of 240 CADR air cleaners, but noisy and drafty on Turbo. However, plasma ionizers emit subtle noises that can be very irritating to some users. Numerous user reviews mention electric "crackling and squeaking noise" from the PlasmaWave, especially audible when running on low nighttime speeds. One amazon.com reviewer bought five new 5500's at once, noticing a different Plasmawave sound level from each. Fans cycle on low with a repetitive acceleration that can irritate those struggling to sleep. More recent user reviews indicate the noise issues, while seemingly a random quality control issue, appear to be increasing. Winix marketing emphasizes that 5500 is "CARB Compliant," (less than 50 parts per billion ozone). While many buyers are rightfully concerned about ozone emissions, this is not really an issue with the Winix line. My estimate of Winix PlasmaWave ozone emissions is a negligible 2-3 ppb. User reviews say "night" mode lights, while dimmed, are still distracting in a dark bedroom. And finally, some reviewers mention PlasmaWave interference with WiFi cell phone hot spot signals. Winix 5500 dimensions are 16.3 by 8.5 by 21.7 inches, big enough to be awkward, since there is no carry handle. Winix 5500 is Energy Star qualified, and consumes just 6 Watts on low, 70 Watts on high, and 90 Watts on Turbo. 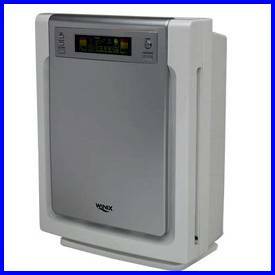 Many weak (CADR less than 150) air cleaners are available in the under-$200 price class, most are too anemic to make much difference for allergy or asthma. The Winix 5500 is strong enough to clear a medium room of pollen or mold, the two biggest reasons for a purifier purchase. Heavy odor or smoke situations will need extra carbon, easily added by anyone handy enough to wield a pair of scissors. The biggest competitor for Winix 5500 is the top-selling remote-less Winix 5300. The Winix 5500-2 is the revamped model of the widely popular WAC-5500 and big brother to the recently revamped and 5300-2. Almost visibly indistinguishable from the 5300-2, outside of a slightly darker grey exterior color; this unit shares the same body, specs, updated controls and electronics. Primary differences from the 5300-2 include a washable Advanced Odor Control carbon filter (more on that later), remote control, and slightly higher price. As discussed above in the 5300-2 review, changes from the older WAC-5500 are numerous, including the elimination of the long life “washable” HEPA filter with a quoted 3 year life, a new control panel, integrated on/off timer, and sleeker overall look. I never really bought into the “washable HEPA”, so that will not be a feature that is dearly missed. The Winix 5500-2 air purifier contains an Advanced Odor Control (AOC™) Carbon Filter. The AOC™ carbon filter on the 5500-2 has a thick honeycomb pattern on the carbon insert. Trapped inside those honeycombs dwell thousands of beads made from pure activated carbon; removing contaminants and impurities through chemical adsorption, and capturing and neutralizing odors fairly sufficiently for an Asian invasion air purifier on the low to medium price tier. The AOC™ carbon filter is washable, but this does not insinuate placing the filter in the sink and dousing soap on it. It merely implies spraying it down with water. I recommend cleaning the AOC™ carbon filter once every three months and replacing after a year (6 months for heavy smoke/pet environments). Servicing of the pre-filter suggests cleaning (vacuum or wash: no soap, just water) once every fourteen days. This frequency seems a little on the high side, possibly due to the finer mesh material now included in the pre-filter. Most users will clean monthly. No replacement warranted as pre-filter is permanent. The 5500-2 is rated for an area equivalent to 360 sq. ft., approximately 19’ x 19’. For best performance, I recommend a room not larger than 250 square feet. Dimensions: 23.6” H x 14.9” W x 7.8” D, and weight 17.6 pounds. Magnetic doors at the top are clever, along with hooks at the bottom, to make it simple to open and close panel. A large notch at the back (top of the unit) makes for ease of transportation. Again, the control panel has been updated with a timer function, which the WAC5500 did not possess. The original Winix 5500 air purifier was the crème de la crème in the air purification world for its price point. Like sequels of our favorite movies, they don’t always make the grade. I do, however, have a very positive impression of the Winix 5500-2 air purifier, and have always been “sold” on the odor destroying capability of Winix PlasmaWave Technology. If you agonize with allergies, are a pet owner, or sincerely have a craving for clean air, the 5500-2 HEPA air purifier is a good contender with lots of settings and features at an attractive price. Winix PlasmaWave 5500-2 Air Purifier at Amazon.com. Winix PlasmaWave 5500-2 Air Purifier at Sylvane.com. The original PlasmaWave size 21 chassis had another "upgrade," the Winix 6300, summarized briefly here. General remarks about 5300/5500 above apply to 6300. In my opinion, Winix 6300 was a response to the "permanent filter" debacle that swept the industry (Winix was not among the guilty). But the 5500's washable filter, which was never advertised as "permanent," was under-performing, so 6300 went back to the standard NO-wash one-year HEPA. And Winix got another opportunity to raise price on what is a little changed product. Winix 6300 includes the coveted remote. Winix 6300 can be distinguished from 5300 and 5500 by the two-tone silver color molding of the front panel. Winix 6300 has not had as much sales volume as its cousins, as demonstrated by just 85 customer reviews at amazon.com (avg 4.4 stars). Winix 6300 was introduced at a suggested retail of $219.99, slow demand has it selling for about the same as the Winix 5500, about $200. Filters are the economy two-filter size 21 set discussed above (no permanent fiberglass screen and cassette tray). 6300 has the same Auto Mode, air quality displays, filter change light, sleep mode, remote control, and controls as the other members of the Winix PlasmaWave Series. Even with the slightly higher price, I still like Winix 6300 better than all department store brands. With so many nearly identical Winixes, Winix 6300's main competition is its brothers Winix 5500 and 5300. A few years ago, Winix introduced the "all new" Winix FresHome product series, with restyled cabinets and strong CADR ratings. But the FresHome "upgrade" had been previously sold for a couple years as Sears Kenmores. In general, the newer Winix models sell slower than the Plasmawave Series and get slightly weaker consumer reviews. Here we have a number of identical appearing futuristically styled cabinets - all of which will appear identical in online photos, regardless of air purifier size or internals. Note that the premium-priced Winix Signature Series uses the same chassis and fan as the FresHomes, but carries the cassette filters and slightly more elaborate controls. FresHome is the two-filter economy model, with the "P" at the front of the model number (P300...) and the Signature version is the premium cassette filter model, with "U" as the number prefix (U300...). There are a few user reviews complaining of loose fitting filters in the FresHome Series, which I think is generally slightly inferior to, though more attractively styled than, the older PlasmaWave Series models. Winix Freshome P450 air purifier is the same as Sears "Kenmore 85450." Winix P450, company part number 113200, has modest sales, with 53 amazon.com buyer reviews averaging 3.9 stars. So Winix P450 is a "300 CADR" air purifier, among the upper echelon in terms of fan strength. With full-time Turbo speed operation, AHAM and Winix rate P450 for 450 square feet rooms. Few consumers will run a 300 CADR air cleaner on high for long, let alone 24/7 as implied in these puffed-up room size ratings. P450 will perform much better if placed in a room no bigger than 290 square feet. Freshomes have the Winix two filter "economy" filter trains, one carbon-impregnated prefilter and one True-HEPA filter. Shoppers should note the very similar appearing Winix U450 Signature Series air purifier, which sells at a higher price and carries the "Ultimate" Cassette filter cartridge. The prefilter combines with PlasmaWave's oxidation to eliminate light household odors. 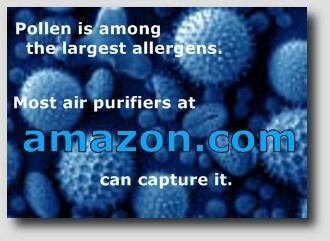 AllergyBuyersClub.com's experienced staff gave P450 just "three stars" for chemical and odor filtration. The size 25 HEPA filter will need yearly replacement in normal homes, smoking or pets will call for more frequent filter replacement. The annual filter set is about $80, Winix #113250 "Size 25," which includes a HEPA and four prefilters. Winix FresHome P450 is automated, with air quality sensors that speed up the fan (speeds 1 through 3 only) when impurities are sensed. Air near the machine will get clean quickly, depriving the sensor of input and lowering fan speed while pollutants are still present several feet away. To be effective, Winix P450 must run on manually-selected Turbo speed whenever possible, especially for the hour before bedtime when used in Auto Mode or Low for sleep. But many user reviews say odor sniffing ability is pretty good. LED display lights up with five different pollutant levels. P450 has a remote control which changes fan speed but does NOT control the plasma ionizer. Conspicuously absent is the PlasmaWave On/Off switch. In the P150, U300, and U450 user manual, there is a sentence on Plasmawave On/Off (hold Auto button for 3 seconds), but the P450 manual does NOT have this sentence. Many user reviews are in agreement, saying the P450's plasma streamer cannot be turned off. The programmable timer function, available on premium Winix models, is also absent on P450. Sleep mode slows the fan to low and dims the display when the room is dark. Like other Winixes, P450 has a pretty good sound profile, putting out 27 dB on low and 60 dB on (300-CADR) Turbo. Winix P450 also has the PlasmaWave "squeal" issue, which cannot be turned off. But it is the lower total sound level that allows users to notice the PlasmaWave's noise to start with. User reviews note the too bright top panel, which many report covering with tape. An EPA Energy Star Qualifier, Winix P450 pulls 11 Watts on low and 110 Watts on Turbo. A large air cleaner, P450 has a molded-in handle for carrying between rooms. Quality in the newer series is not as consistent as earlier Winix models, and the always-on PlasmaWave may not suit sensitive individuals. Winix P450 delivers lots of power for the price, and is a good choice for mold and pollen allergy due to the strong power. P300 is the mid-sized member of the Winix FresHome Series. Winix P300 averages "200 CADR," just strong enough for a medium sized room, and weaker than Winixes of the Plasmawave series, which are 235 CADR purifiers. With full-time Turbo speed operation, AHAM and Winix rate P300 for a 300 square foot room, way too large. For best results P300 should be installed in a room no bigger than 215 square feet. Winix FresHome P300 and premium sibling Winix Signature U300 are two versions of the same Size 21 machine. FresHome P300 is the economy filter train variant, with two filters and no cassette tray. Sales of the FresHome 300 are a bit slower than the Plasmawaves, with 137 customer reviews at Amazon yielding 4.1 stars. P300 ships with 4 extra carbon filters. Recommended HEPA filter replacement is every year with pre-filter changes predicted every 3 months, pets and smokers should expect additional prefilter expenses. FresHome P300 has a remote control, but it does not switch off the Plasmawave. User reviews are in conflict as to whether the Winix "secret" trick of holding down the Auto Mode button will turn off the PlasmaWave. It uses the same chip set as P450, whose automation features are discussed above. A carry grip is molded into the back for easier transport. Winix FresHome P150 is the smallest of the Winixes, built around the Size 17 filter. This air cleaner was sold by Sears for a few years as the Kenmore 85150. P150 has an identical appearance to other FresHome Series machines, but measures only 18.5 by 13.8 by 9.1 inches. This puts it in the upper end of the desktop air cleaner size range, but P150 can be a reasonable alternative to low powered models advertised as suitable for desktop use. This same purifier is sold at Bed Bath Beyond as the Winix B151, $199, with a framed prefilter added. AHAM and Winix suggest a room size rating of 150 sq. ft. This is a "100 CADR" air cleaner, well below the 150 minimum recommended by Consumer Reports (among the few things CR has said about air purifiers that I agree with). I can recommend the P150 ONLY for very small rooms or office cubicles less than 100 sq. ft. Some owner reviews say they move the P150 among the smaller rooms (bath, kitchen...) and use it as an adjunct to a bigger purifier in the bedroom. 74 Amazon customer reviews average 4.3 stars, but numerous free-product subsidized reviews, are present. P150 has 4 fan speeds, reviewers say the lower speeds are very quiet. Allergybuyersclub.com tested the little Winix at 26-52 dB(A), so it is a bit noisy on Turbo. But the vast majority of reviewer sound gripes concern the PlasmaWave's intermittent clicking or buzzing noise, which a few noise-sensitive users dislike. P150 has Auto and Sleep Modes, but no remote. Another user review issue is loose fitting HEPA filters. Loose fitting filters are extremely common in this price class, I would seal and secure all (not just the Winix) with celophane tape. Winix Size 17 replacement filters are used by the P150, U150, 9300, and 9000S, all slow sellers. Although Winix has never left owners without replacement filters, Size 17 is much harder to find in dealer inventory. But the Fellowes HF-230 replacement HEPA is a perfect fit and costs less than the Winix version (Fellowes is a rebranded Winix). Again, there is variable user review feedback on using the Auto button hold down trick to shut off the P150's PlasmaWave. I have not tested the P150, but users I trust say the button hold down does work on their P150. One Amazon video review shows the Auto button trick failing. Amazon changes price on this one frequently, I saw $129.99, $151.15, $143.99 and up to $260.00 on successive price checks. Winix Signature air purifiers, designated by the prefix "U" in the model number, are the higher-priced versions of the same chassis sold as FresHomes. Signature models, U450 and U300, which carry the cassette tray filter package, are the Winix flagship models. When Sears dropped the Winix rebrand deal (as Sears repeatedly does with every manufacturer), Winix was stuck with multiple product styles. Winix Signature U450 (WACU450), the premium variant of the old Kenmore model, was "introduced" as new in 2012, with a suggested retail of $439.99. Winix P450, described above, is the economy version. Both 450 variants have Winix Size 25 filter bays, and can use either premium cassette or economy filter packages, but NOT at the same time (economy filters are slightly too big for the cassette tray). U450 has the cassette system (permanent fiberglass prefilter and plastic tray), filters with anti-microbial coatings, a little extra carbon in what Winix calls the "AOC" filter, Sleep Mode (dims lights in dark), and off/on control for the plasma streamer, all absent on the identical-appearing Winix P450. The price gap has narrowed, but is roughly $100 after a couple years of sales. AHAM and Winix unrealistically list 450 sq. ft. as an appropriate maximum room size, I say this 300 CADR machine should be used in 290 square feet, noise-sensitive individuals should go even smaller. Also, the AHAM room size calculations are based on "standard" 8-foot ceilings, not as common as in the past, buyers with high ceilings should shoot for lower square foot installations. Winix U450 is a strong blower, excellent for clearing a room of allergens quickly. 70 customer reviews at Amazon average 4.0 stars. Replacement filter costs are around $140 for the Size 25 cassette tray system, or $87 to downgrade to the economy filters. Like U450 and P450 described above, Winix Signature U300 is very similar to FresHome P300, but with cassette filter tray system, anti-microbial filters, more carbon for odor control, Sleep Mode, and switchable PlasmaWave. AHAM-recommended maximum room size is 300 sq. ft., too large as usual. I recommend Winix U300 for a bit more than 200 square feet, lower if noise sensitive or ceiling is higher than 8 feet. The Winix U300/P300 price differential is now about $90. Annual replacement filter costs, for Winix Size 21, are around $90 to retain the cassette system, or $43 for a downgrade to the economy set. These are older Winix models, introduced with the original Plasmawaves. Until the Signature Series Winixes were introduced, the Pets were flagship models. Winix Pet 9500 was introduced at the beginning, alongside the original PlasmaWaves. Note that Pet models also have the same plasma ionizer, just the name emphasis is different. At Amazon there are around 400 customer reviews averaging 4.5 stars, this is evidence of many thousands sold. Pet models carry the "Ultimate" cassette tray filter package, with extra carbon for odors. Winix 9500 is the Size 21 version of the Pet Series. While adequate for medium rooms, these CADRs are weaker than other Winix models selling for less. AHAM's recommended maximum room size 284 square feet, too big. I recommend Winix 9500 for rooms smaller than 180 square feet. The one-year Ultimate Pet replacement cassette cartridge filter is about $100, it must be purchased as a set.